India has the most colourful and complex culture. The way people look, their language and food, their way of dressing, music and dance; everything is different every 50 or 100 kilometers in the country. And one place where you can really see the complexity of this culture is the Kumbha Mela. Yet again the largest spiritual gathering in the world, the Simhastha Ujjain Kumbh Mela, is about to take place this year from April 21 to May 22nd, 2016. During this, the devotees from around the world will gather for a dip in the holy Shipra River and it is expected o attract about 50 million people from across the country and abroad. People brave the extremely hot weather to take this journey of faith, especially on main bathing dates. This year the first Snan in Ujjain will be held on April 22. The arrangements have already begun to transport the pilgrims to their desired destination. Since the bulk of pilgrims use trains as their mode of transport to travel, Indian Railways have announced Kumbh Special trains. Most of them will run between Ujjain, Bhopal, Nagda and Bairagarh stations These Special trains will be available from April 20-30. Below are details of the trains. It will run on all days from April 20 – 30. It shall leave Ujjain at 18:05 pm and will reach Bairagarh at 23:20 pm. It will run on all days April 20 – 30. It shall leave Bairagarh at 19:00 pm at will reach Ujjain at 23:45 pm. It will run on all days from April 20 – 30. It shall leave Bairagarh at 09:50 am and will reach Ujjain at 14:15 pm. It will run on all days from April 20 – 30. It shall leave Bhopal at 05:00 am and will arrive at 10:25 am. It will run on all days from April 20 – 30. It shall leave Ujjain at 19:35 pm and will arrive at 00:10 am. It will run on all run on all days from April 20 – 30. It shall leave Ujjain at 06: 10 am and will arrive at Bhopal at 12:20 pm. It will run on all days from April 20 – 30. It shall leave Bhopal at 15:40 pm and will reach Ujjain at 20:20 pm. It will run on all days from April 20 – 30. It shall leave Bhopal at 13:35 pm and will reach Ujjain at 19:15 pm. It will run on all days from April 20 – 30. It shall leave Nagda at 18:40 pm and will reach Ujjain at 21:10 pm. It will run on all days from April 20 – 30. It shall leave Nagda at 18:10 pm and will reach Ujjain at 21:40 pm. It will run on all days from April 20 – 30. It shall leave Nagda at 09:00 am and will reach Ujjain at 10:50 am. It will run on all days from April 20 – 30. It shall leave Ujjain at 11:10 am and will reach Nagda at 13:00 am. It will run on all days from April 20 – 30. It shall leave Ujjain at 13:45 pm and will reach Nagda at 15:30 pm. It will run on all days from April 20 – 30. It shall leave Ujjain at 15:30 pm and will reach Nagda at 17:50 pm. It will run on all days from April 20 – 30. It shall leave Ujjain at 09:05 am and will reach Nagda at 11:05 am. It will run on all days from April 20 – 30. It shall leave Ujjain at 11:20 pm and will reach Nagda at 12:45 am. It will run on all days from April 20 – 30. It shall leave Ratlam at 17:15 pm and will reach Ujjain at 18:35 pm. It will run on all days from April 20 – 30. It shall leave Ratlam at 16:30 pm and will reach Ujjain at 17:30 pm. Train Name and Number: 000402 Chittaurgarh – Ratlam Simhasth Spl. It will run on all days from April 20 – 30. It shall leave Chittaurgarh at 19:15 pm and will reach Ratlam at 00:05 am. It will run on all days from April 20 – 30. It shall leave Ujjain at 18:35 pm and will reach Guna at 01:25 am. 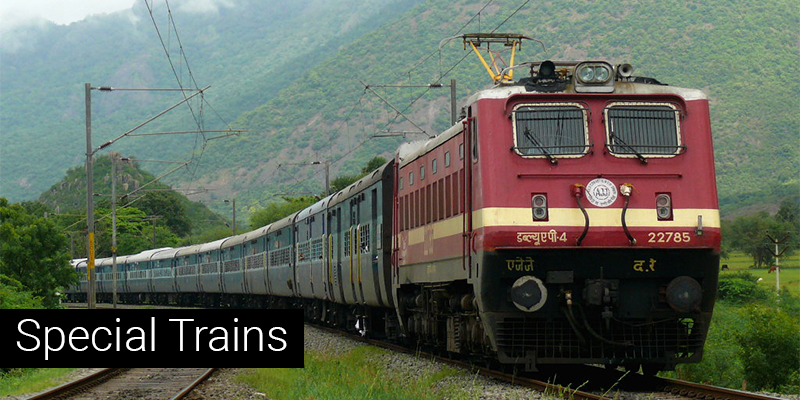 Next articleWhat makes your parent’s train travel with High Blood Pressure Safe? Any trains from Ujjain to Delhi ?? Welcome to Simhasth in Ujjain. Hindustan ka dil dekho mera M.P. dekhoo …….aao..
Any spl train from Mumbai to Ujjain for kumbh mela?